The ESA Gaia spacecraft was launched successfully this morning and it is currently on its way out to L2. 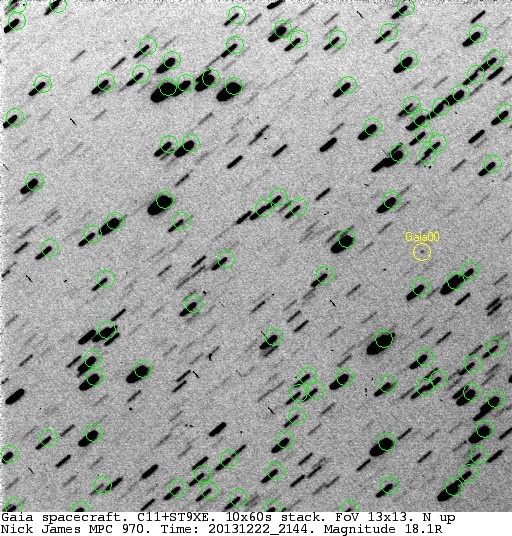 As I noted in my Sky Notes last Saturday [url=http://www.youtube.com/watch?v=gzVG88ev2bE&feature=c4-overview&list=UUqQ...(Youtube about 28min in)[/url] it should be visible from the UK as it moves out.The best place to go for predictions is Gaia in the Sky which is a special website set up to provide predictions for optical tracking. From the UK Gaia will be at its best around 23h UT tonight in the north of Orion and could be as bright as 12th magnitude. It has already been observed by Dave Herald in Australia and he estimated it to be around mag 8 at 15h UT.The forecast for here is that it should clear after 23hr. I'll be trying to get some images and will post details if I get anything. I'd be interested to hear from anyone who manages to get an image.Nick. The guys involved with the Gaia Ground Based Optical Tracking project have been using these images to calibrate their brightness model for the spacecraft. They are keen to get more optical observations since Gaia is now near the phase angle that it will have at L2. This will allow them to predict the final magnitude more accurately. For us, the spacecraft is well placed in the northern part of Orion, on the border with Taurus. It's about twice as far away tonight so I would guess that it would be around mag 12 based on last night's observation.The weather doesn't look good for me tonight. If anyone does manage to get some mag estimates tonight then please post them here and I'll forward them on.Nick. I managed to observe Gaia again tonight between rain and gales but it is dramatically fainter than a couple of nights ago at around mag 17.6. It is also about three arcmins SW of the position predicted. I assume that the magnitude change is due to a change in the spacecraft attitude so that the sunshade is now offset but I need to confirm this.At present it is around 400,000km away so it will be around 3 mags fainter at L2.Nick.Update at 08:37, Dec 22 - The Gaia optical tracking team have confirmed that the reason for the dramatic fade (a factor of a around 100) is a change of spacecraft aspect angle. The large reflective sunshade is now angled at about 45 deg to our line of sight. There's an interesting paper on this here. This is the final aspect angle that the spacecraft will have at L2. Thanks for the update on the solar shade angle. I will definitely revisit Gaia given clear skies. Hopefully tonight. Dave,That would be great. The GBOT team are keen to get magnitudes at the current aspect angle so any observations you can get would be useful. Assume that it will be around mag 18 tonight and it may be a little off the predicted position.Nick. I have got the calculated field of view, but can see no sign of anything moving in the field. I will persevere for a bit longer. Dave,It is a little off the predicted position. I've just measured it at mag 17.8:2013 12 22.89666 06 02 53.78 +14 12 44.8 17.8 R 970This is around 5 arcmin SW of the position given for my location in http://gaiainthesky.obspm.fr/fov/.Update at 21:45 - With a longer stack and higher SNR it is actually 18.1R using UCAC-4. Here are the images (all stacks of 10x60s, 13' square, N up):image from 21:34UTCimage from 21:44UTCimage from 21:55UTCimage from 22:06UTCYoutube timelapse movieNick. 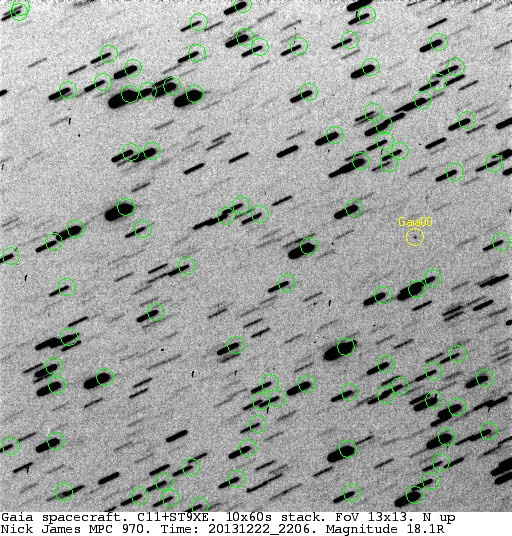 Dave,Are you stacking images to offset at Gaia's sky motion? At present it is 2.86"/min in PA300 but this changes quite quickly. 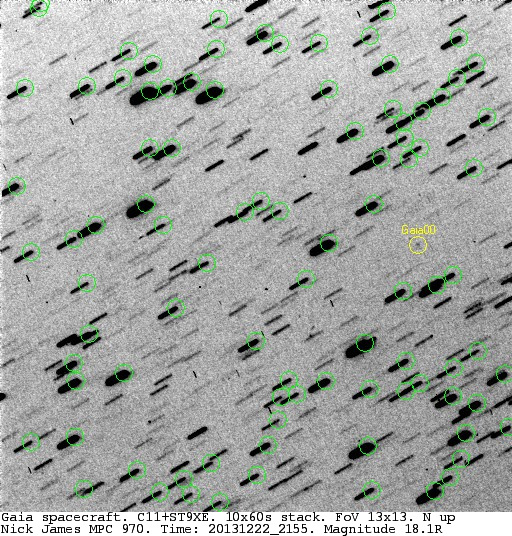 The best way to get this info is to use the MPC space junk page here although I expect ESA would object to Gaia being called space junk!Given that Gaia is now fainter than mag 18 it is important to stack at the correct rate and offset so that it is not smeared out. 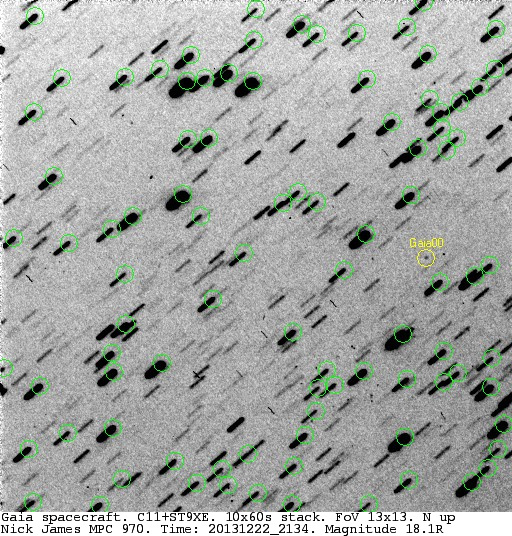 This is very good practice for imaging faint asteroids so it is worth persevering.Nick.